Growing up, no one encouraged Keiona Haggins to go to school. “I was only told to not end up pregnant or in jail,” she said. She lived in a home where emotional and physical abuse were rampant. As a teenager, she worked two jobs to afford food and transportation to school. For two years she didn’t have a bed to sleep in, and at 17, she was kicked out of her family’s home. “I came home from school one day and it was clear that I wasn’t welcomed there anymore,” Haggins said. But she was determined to make a better life for herself. On May 3, she will receive an Associate in Arts degree with Polk State College’s 118th graduating class. When Haggins was a student at Lakeland High School, Daisy Rivera, an advisor with Educational Talent Search, introduced her to the opportunities available at Polk State Lakeland Collegiate High School. “My advisor kept hearing me talk about my dreams of going to college and my concerns that I would never be able to afford it,” Haggins explained. At Polk State Lakeland Collegiate High School, students have the ability to take college courses and earn their Associate in Arts degrees at no cost to them, while simultaneously working on their high school diplomas. Haggins didn’t graduate with an Associate in Arts degree due to challenges she continued to face outside of school, but she received the foundation and motivation she needed to never give up on her goals, she said. In 2012, other parts of her life started to fall into place when she married her husband. Haggins received her high school diploma from Polk State Lakeland Collegiate High School in 2013. She had her daughter in 2014, purchased a home in 2016, and had her son in 2017. All the while, she was taking online classes while working a full-time job with Marriot. She is also an active volunteer in the community. 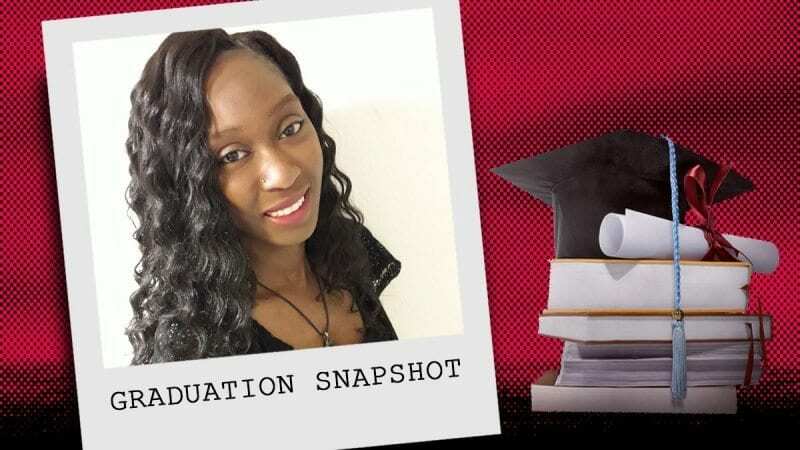 Seven years since beginning her journey at Polk State, Haggins, 23, will be the first in her family to graduate from college. She plans to enroll at the University of Florida to pursue bachelor’s and master’s degrees in Business. Haggins and her husband aspire to open a financial and business consulting company. The feeling of achieving her degree ranks high with the accomplishment of becoming a homeowner, she said. The experience also helped Haggins mend her relationship with her family, despite the difficult home life she experienced growing up.